Save user-uploaded content in Cloud Datastore, a non-relational (NoSQL) database built for automatic scaling, high performance, and ease of application development. In this example, you add code to the gophers-3 sample, which is the final product from Handling HTML Form Data. Classify each user-submitted post into three fields: the author's name, the message content, and the date and time the user posts the message. Define each user-submitted post as a data structure with three fields: Author, Message, and Posted. Add the following fields to your templateParams data structure to update your dynamic HTML file. Save new values, otherwise known as entities, to Cloud Datastore with datastore.Put function. The appengine.NewContext function returns a context.Context value associated with the current request. 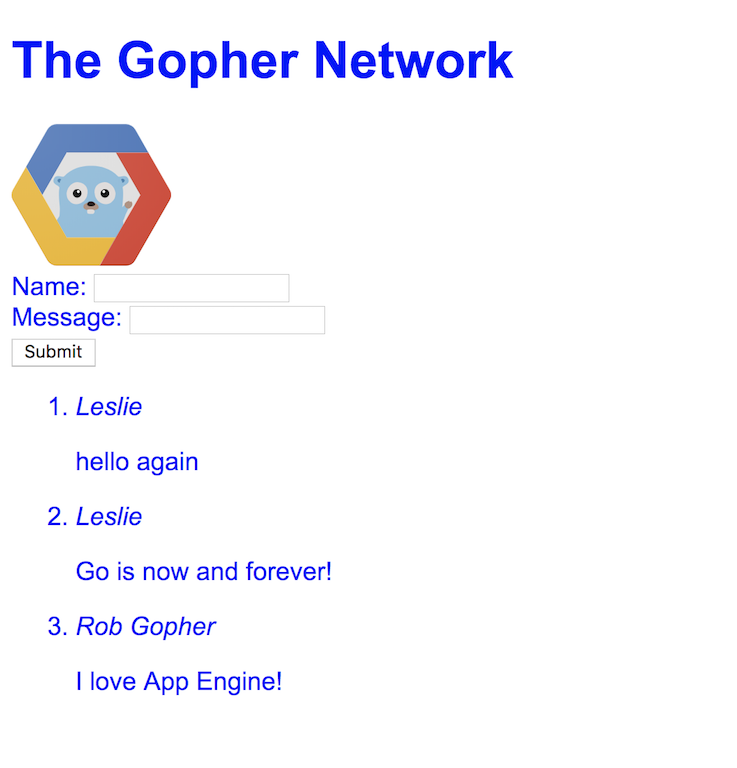 This is an opaque value used by many functions in the Go App Engine SDK to communicate with the App Engine service. In Cloud Datastore, a key is a unique, auto-generated identifier. There are complete keys that point to an entity, and incomplete keys that point to an entity that is not yet stored in Cloud Datastore. When you create a key, you must specify the kind. Entities are of a given kind, similar to the way rows in relational databases belong to a given table. For more information, see the Entities, Properties, and Keys. The last parameter in the NewIncompleteKey function is a *datastore.Key pointing to the parent of the key you're creating. For now, it will always be nil. The if statement handles errors by logging them, sending an error code, and updating the notice in index.html. Query Cloud Datastore and iterate over the results. For more information on queries, see Cloud Datastore Queries. Congratulations! You built an application that can store and retrieve data from Cloud Datastore. Next, learn how to authenticate users to your application using Firebase Authentication.